It’s like a time capsule! If you’ve ever wanted to time travel, then this house is for you. 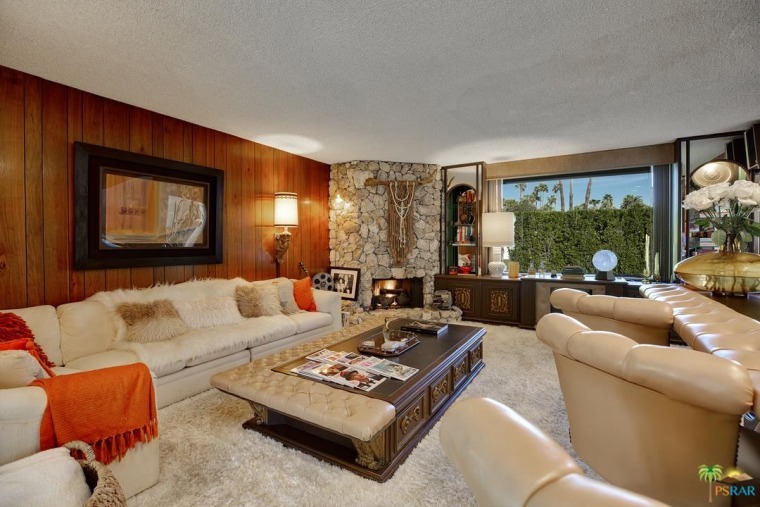 Built in 1969, this midcentury modern home located in Palm Springs, California, is like a time capsule of decor trends past. 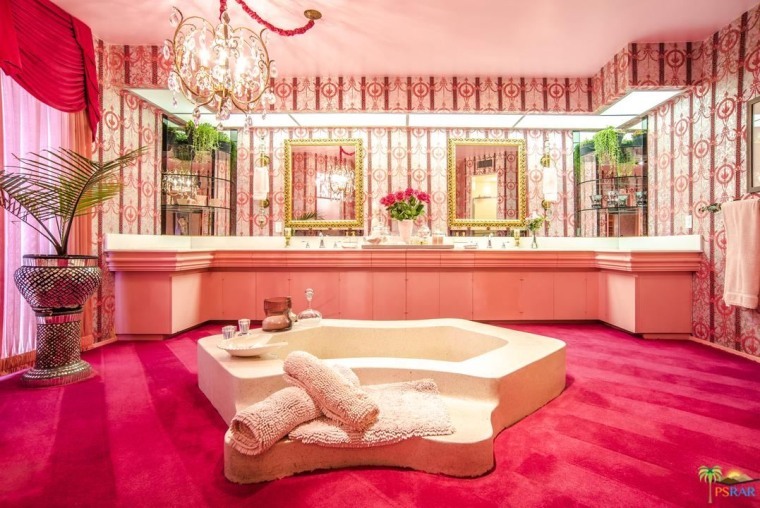 There’s a bubble-gum pink master bathroom, shag carpeting and popcorn ceilings. Each room is bursting with color and will bring you back to those beloved visits to grandma’s house. But the nostalgia comes with a hefty price tag. The 3,350-square-foot house is currently on the market for $1.737 million. It may be a little steep, but the new owner will get all the furniture and decor included. It’s literally move-in ready … if you dig that retro vibe. 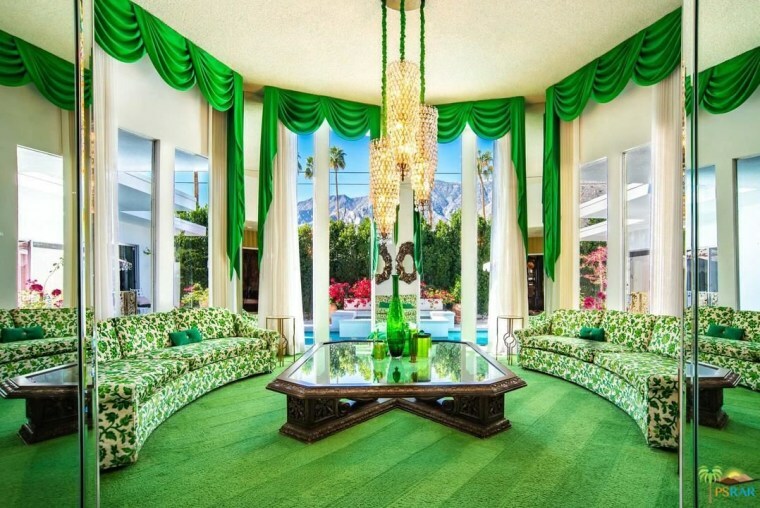 The living room may have your guests green with envy when they come over to visit. 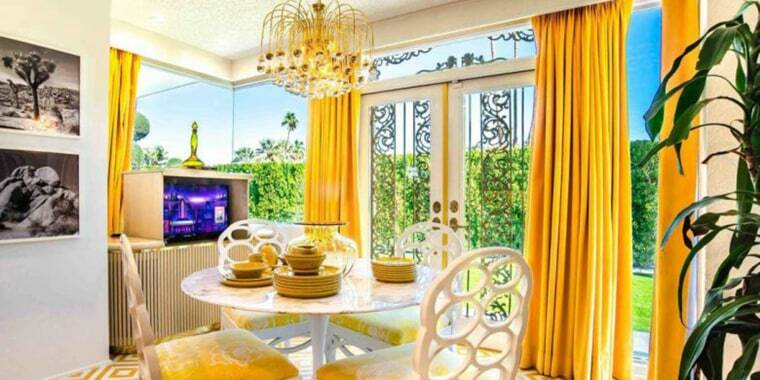 The space features bold carpet, a cool chandelier and dramatic curtains hanging over the floor-to-ceiling windows. If you’re looking for a more casual room, head over to the den that has a cozy stone fireplace, soft shag carpet and wood-paneled walls. 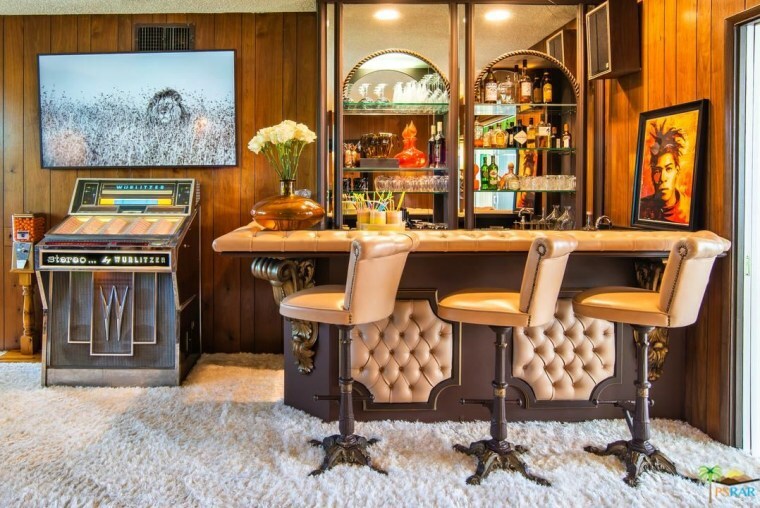 There’s also a three-seat bar in there, along with a working jukebox. The kitchen has been recently updated, but still sticks with the theme of the house. Light Caesarstone countertops look beautiful in contrast to the dark cabinets. The appliances have been upgraded to more modern versions, but they still have that vintage look to them. And the hand-painted Moroccan tile flooring gives the space a pop of cheerful color. The home has three bedrooms and three bathrooms, all of which have their own color scheme. 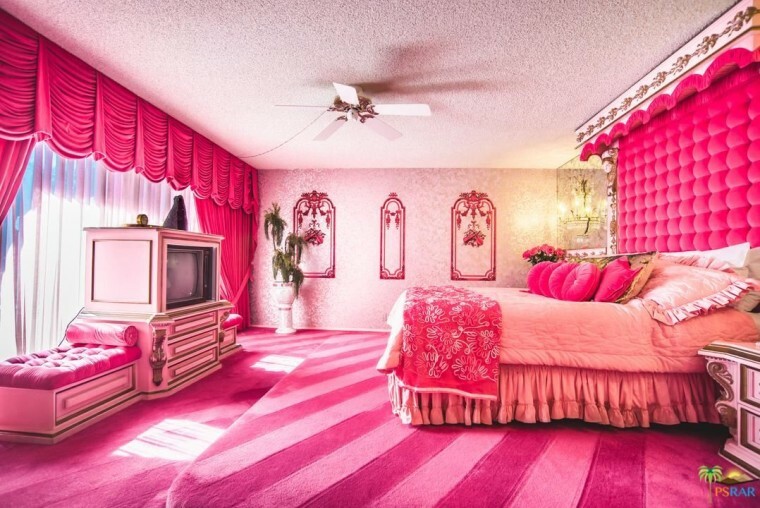 The master suite is filled with hues of pink, from the carpet to the curtains to the bed. And the bathroom has a tub right smack dab in the center of the carpeted room. How about that?! Outside, there’s a recently renovated pool surrounded by lounge chairs and umbrellas, fit for a “Mad Men” style party. 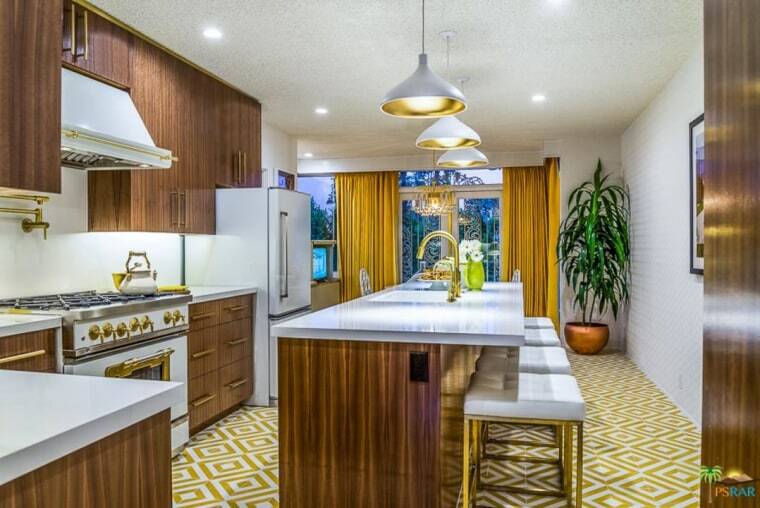 Want to see more pictures of this groovy house? Check out the listing from Kenny Jervis and Berkshire Hathaway HomeServices.